Orchard Park High School senior Peter Meindl has had an extraordinary cross country season . The undefeated harrier has shattered course records at McQuaid, Alden, and Elma Meadows; won the Sectional Championship; won the New York State Championship; and won the North East Regional Foot Locker Championship. But, he's not done yet. The greatest honor for any high school cross country athlete is an opportunity to compete in the "Super Bowl of Cross Country" - the annual Foot Locker National Championships. Only 32 boys and 32 girls can earn the right to run in the most elite race of the year. The top eight runners from each of 4 national regions earn an invitation. Getting into the meet certainly requires a rare combination of hard work, talent, sacrifice, coaching, planning, and luck. Peter Meindl has apparently mastered the needed qualities. Two weeks ago he earned the right to join that elite group by winning the North East Regional race at Van Cortlandt Park in New York. It will be his second trip to the big show. Peter scavenged the last spot on the team in 2000 by tenths of a second. The event will be held in Orlando Florida at the Oak Trails Golf Course Saturday December 8. The distance is 5 kilometers. The competition is the best available in the high school world. It will be televised nationally on the Fox Sports Network. The girls race is scheduled for 9:30 AM; the boys race is slated for a 10:20 AM start. Peter joins, and perhaps will head, an elite group of all-time Western New York athletes who have run in the national championships. 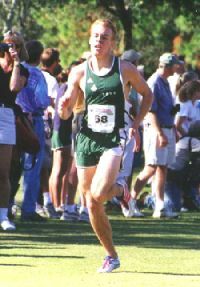 Since the event's inception in 1979 (then as the Kinney National Championships) only three other area boys and three area girls have run in the elite meet. 2001 Peter Meindl, Orchard Park, ?? ?, ??? 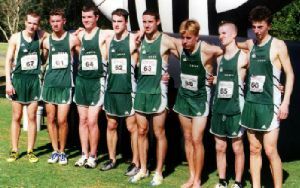 BATTLE WEARY - Peter Meindl, 3rd from right, poses with his North East team mates in Orlando Florida after the Nationals in 2000. Note the spike wound on Peter's right shin. 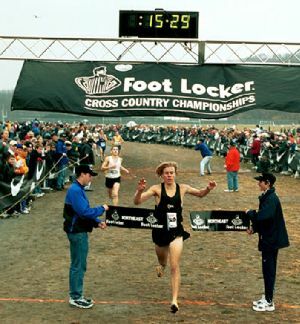 LAST YEAR'S FINALS - Peter Meindl racing in the 2000 Foot Locker Cross Country Championships. 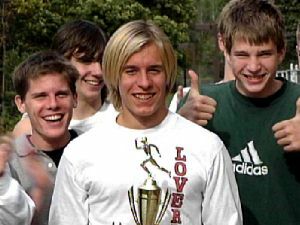 THIS YEAR - The 2001 Foot Locker North East Regional - Peter Meindl races to victory in 15:29.